At Botanical Alchemy we have collected Flowers from all around the world to go into our Synergistic Blends. Our blends can have up to 8 ingredients although most have less. About 95% of our Flowers have been made by our personal alchemist Clifton. The remainder have been made by Mara, Barbara, or Beatrice. All three are very skilled Flower Essence makers that he trusts completely and are lucky enough to call friends. Whenever possible our flowers have been wildcrafted or from very happy gardens. They are mostly, but not always organic. Usually grown in nature and always gathered with great care and attention to the quality of the flower and the timing of celestial influences. These Individual Essences are then blended by Clifton into the Synergistic Blends that we offer. The quality of our work is such that we are often used by other flower essence companies to consult or complete various parts of their work for them. Many of these Flower Essences have more than one gift to share and will be used for different purposes in different formulas. 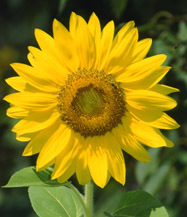 A good example of this is Wild Sunflower, made by Clifton in New Mexico. It is used in the Immune Energy (Echinacea Blend) for its protective and auric strengthening properties, and is also in the Healing Heart (Hibiscus Blend) to bring in better relationships that are more nurturing for you after the other flowers have helped you heal the effects of current and past relationships.